Untitled (Blue Sky), 1962. Oil on canvas and attached canvas panels. 84" x 72" (213.4 x 182.9 cm). The Brant Foundation, Greenwich, Connecticut. 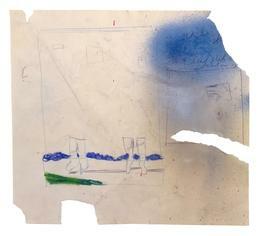 Study for Untitled (Blue Sky), 1962. Mixed media on paper. 9" x 10" (22.9 x 25.4 cm). Private Collection.